Sorry if the title of my post is a little misleading. I’m not referring to some special anniversary edition burger that I got to try, although the burger itself was pretty special. The “anniversary” is actually in reference to my 5 year wedding anniversary that my wife and I celebrated earlier this year. This may become a recurring theme, but the wife (boy, do I love this woman!) willingly let us celebrate at a restaurant where I could get a burger to sink my teeth into. I know, I know…I probably should’ve taken her to a nice fancy restaurant, maybe a nice Italian place with romantic ambience or something, but I wanted a burger. Can you blame me?? Back to the food… We started with an appetizer – a kettle of green chili pork served with hot buttered flour tortillas. Just repeating the name of the appetizer makes my mouth water. In all honesty, I was pretty full after the pork, but I wasn’t about to let that stop me from enjoying my “Half A**” Burger in its entirety. Well…if we’re being honest, I had actually gone in with the intention of eating their “Big A**” Burger, but I couldn’t do it. A 3/4 lb burger topped with poblano pepper, cheddar, smoked pepper bacon, lettuce, tomato, onions, pickles and served with a side of fries was just too much for me to handle. Shame on me. I know. I opted for the more manageable 1/2 lb patty with all the same fixins. The poblanos added a nice subtle heat, the veggies were crisp and fresh, and the bacon was perfect – wonderfully thick, amazingly crisp, and appropriately peppered. The bacon strips also imparted a complementary smoky flavor to the burger. The Half A** was on the tall side, so eating it was a bit of a challenge and required frequent use of my napkin. But I didn’t mind the eating difficulties one bit as the flavors were spot on. 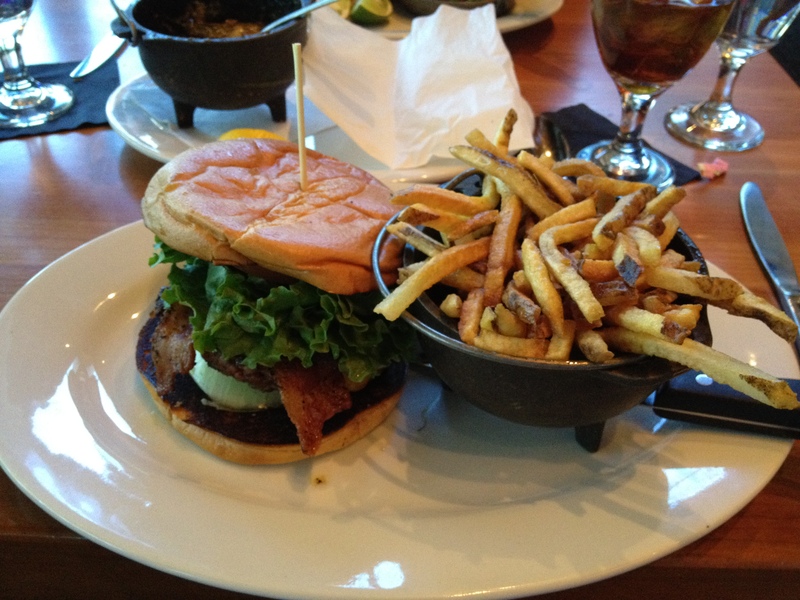 My wife and I really enjoyed our Roaring Fork experience and hope to eat there again soon. Next time, Big A** Burger…next time.